24 Bars (24 Mesures, France, Canada, 2007) – Three characters will have their paths crossed on Christmas Eve. The first of them is the fake blonde prostitute Helly (Lubna Azabal), who’s trying to contact her son against his caretakers’ will, while trying to make the money she needs. About to have a breakdown, she meets Didier (Benoit Magimel), who offers to pay her if she pretends to be her fiancee when they visit his hospitalized father. A tragedy happens, and Helly meets Marie (Berangere Allaux), a lesbian whose conflicted relation with her apparently selfish mother has twisted her love life. Lonely and seeking nothing but companionship and a feel of familiar bond, they’ll end up in a night club with a third lonely soul, Chris (Sami Bouajila), himself also coming from an earlier seething encounter, although poorly connected to the others. Despite of the strong and convincing performances (especially Azabal’s), the stories lack profundity, sometimes even turning out superficial. Lars and the Real Girl (USA, 2007) – Ryan Gosling’s brilliant portrayal of Lars Lindstrom, an introverted young man in a relationship with Bianca, a custom-made, life-size plastic doll, is one of the best tragicomedy performances I’ve seen in a long time. Of course he has helpful tools around him, as the script is quirky to say the least, treating a dark matter in a soft and unusual manner through sensibility and laughters. 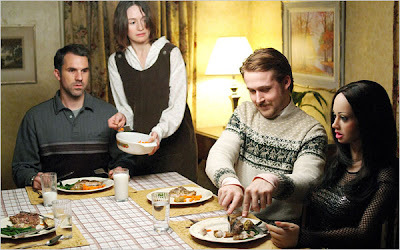 Besides, there’s an outstanding supporting cast surrounding him, first Lars’ familiar nucleus – his older brother Gus (Paul Schneider) who finds it difficult to deal with Lars’ sudden “insanity”, along with his much more understanding and pregnant wife Karin (Emily Mortimer). They will be advised by doctor Dagmar (Patricia Clarkson) to act like if Bianca was actually a real person while hosting her in their house, a decision that will be followed by the entire small town community, which will genuinely embrace Lars’ “girlfriend” kindly. It’s hard to imagine the real world in the way the characters in the movie are portrayed, but in this aspect the film succeeds through its originality.